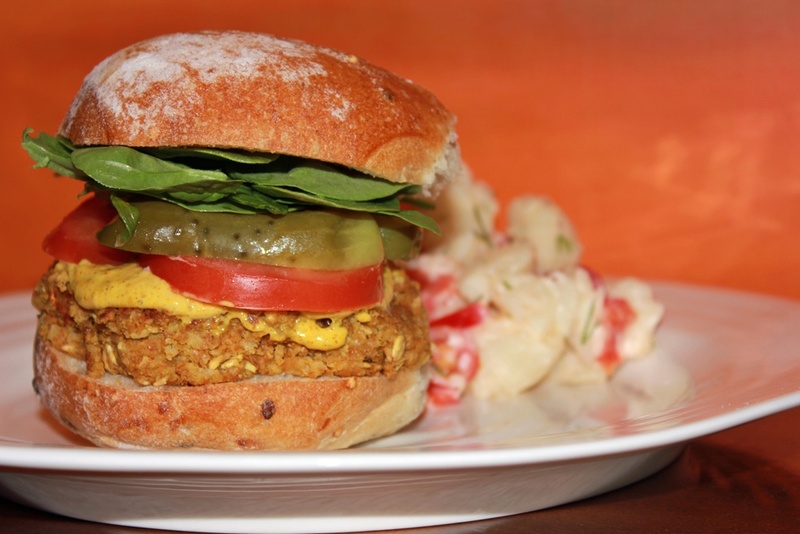 This Indian inspired burger is a twist on the tried and true veggie burger flavour. The patty itself is quite tasty, but paired with the aioli it is full of flavour! Place everything but bread crumbs and oats in a bowl and combine using a hand held immersion blender. Stir in bread crumbs and oats. Allow mixture to sit for 30 minutes. While mixture is sitting, combine aioli ingredients and chill. Using your hands, form mixture into 6 patties. Cook burgers in an oiled pan until they are golden brown on both sides.cPlace any leftovers in an airtight confidant and refrigerate. Here’s an original greenbeekitchen recipe! Burgers are one of my favourite meals, especially during BBQ season. 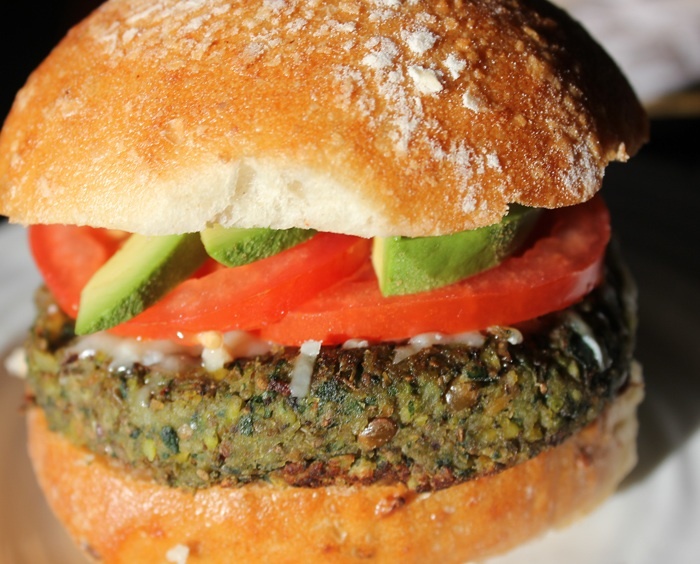 I’ve been working on incorporating green ingredients into this recipe to create a delicious, healthy green burger! In a medium-sized saucepan, bring 1/2 cup lentils and 1 cup of salted water to a boil. Turn heat to medium low and cook uncovered for 20- 30 minutes until lentils are tender. Remove from heat and drain excess liquid. In a wide bottomed pan, heat oil and sauté onion until translucent. Add garlic, zucchini, mushroom, spinach, dill, salt and pepper. Cook on medium heat for 5 minutes, stirring regularly. Transfer to a bowl and let cool. In a food processor, combine lentils and pistachios with cooked vegetables. Pulse until coarsely combined. Stir in 1/2 cup breadcrumbs and 2 tbsp chia seeds. Form into 6 patties and pan fry until browned on both sides. While patties fry, assemble your favourite burger condiments. Build your burger and enjoy! 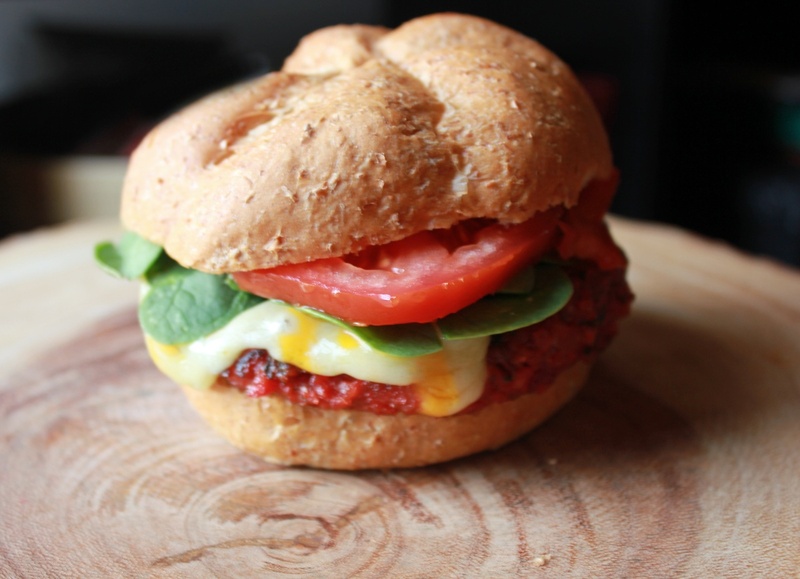 This recipe is the first homemade vegetarian burger I ever tasted, and to this day it remains to be one of the best! Thank you Bergie! I was blown away by the delicious taste and definitely impressed by the number of fresh ingredients used. It has become a favourite of mine, and whenever I have guests to impress, this is a recipe I can count on. Although it looks like a ton of work, once the initial prep of the veggies is completed, it goes quite quickly. This recipe comes from a restaurant called Rebar in Victoria, British Columbia.Enjoy! Heat oil in a wide bottomed pan, and sauté onion until translucent. Add garlic, grated vegetables, salt and pepper. Stir thoroughly and cook for 10 minutes over medium high heat stirring regularly. Transfer to large bowl and cool. Place cooled vegetables, rice and hazelnuts in a food processor. Pulse until coarsely combined. Transfer to large bowl and mix in all of the remaining ingredients. Season to taste. Take a handful of the mix and test it to see if it holds together. If not, add breadcrumbs 1/2 cup at a time until the mixture firms. Shape into patties (I used a 1/2 cup measure) and sauté in olive oil until browned on both sides. While patties fry, stir together the mayo ingredients and assemble your favourite burger condiments. Store leftovers in an airtight container in the fridge. 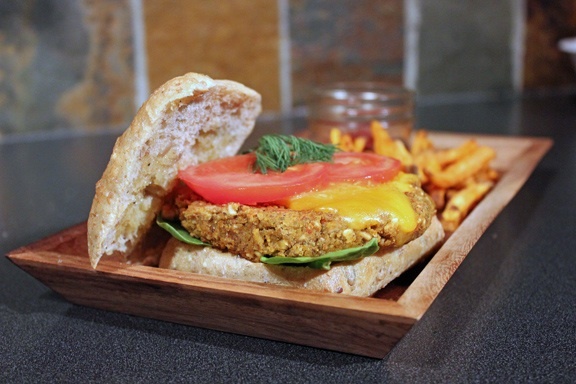 Veggie burgers are one of my favourite spring and summer meals. This recipe has fresh dill as one of the star ingredients giving the burger a fresh, summer taste! I make this on the weekend and store the extras in the fridge for a quick and healthy weekday lunch. In a medium saucepan, bring 1 cup lentils and 2 cups of water to a boil. Turn heat to medium low and cook uncovered for 20- 30 minutes until lentils are tender. Remove from heat and drain excess liquid. In a frying pan, heat oil over medium heat. Add onion, red pepper, carrot, and garlic. Sauté for 5 minutes until onions are soft. Transfer to a mixing bowl. Stir in drained lentils, dill, salt and pepper. Using a hand-held immersion blender, purée until mixture is smooth. Stir in egg, chia seeds, oatmeal and bread crumbs. Let stand for 15 minutes. Use a 1/2 cup measure to scoop out lentil mixture and shape into a patties. Pan fry burgers in a frying pan over medium heat until golden brown. Top with cheddar cheese and allow to melt. Serve on a bun with tomato, spinach, fresh dill and pickles. Life is busy. Let make our food easy and interesting . RAAAW! But not like lion. Like chocolate. Raw like chocolate. It's the Cat's oven mitts.